Valentine’s Day means something different to everyone. Some will go with a classic romantic meal, others will have a social gathering, while yet others will treat it like any other day or even have an anti-Valentine’s Day party! But what’s the one element that can unify all of these events? Cocktails! There’s no better way to indulge and celebrate than by treating ourselves to pretty drinks with sweet flavours and loads of fizz. 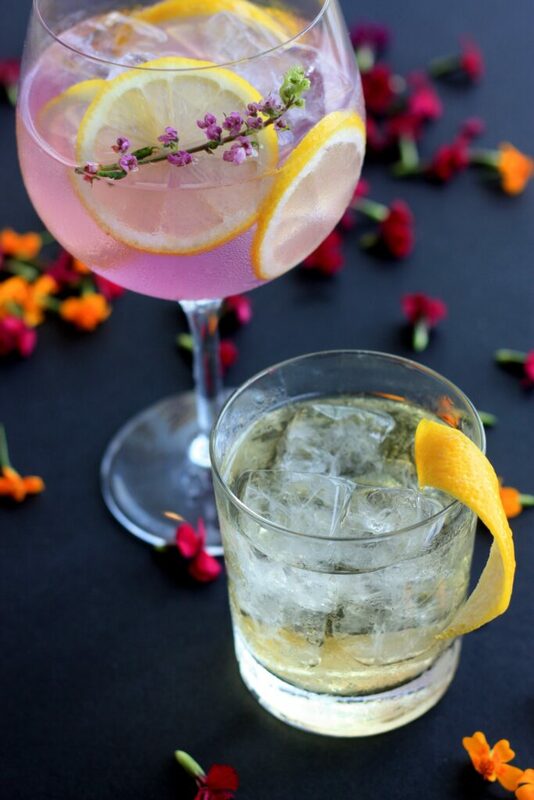 Great drinks can really add something extra to proceedings and making them together can provide a unique opportunity to bond. Make a real production of it; carve fruit into heart shapes, garnish drinks with strawberries dipped in chocolate or add heart-shaped sweets and edible flowers. We’ve got some romantic suggestions* for you to try, so whether you’re feeling loved-up or lonesome, you can console yourself with a really fancy beverage! Coffee-based cocktails are a great pick-me-up after a heavy meal, especially if you’re planning to stay up late for extra Valentine’s cuddles. This cocktail couldn’t be easier to prepare. All you need to do is pour all of the ingredients into a cocktail shaker and shake well for a full minute with a handful of ice. Strain carefully into cocktail glasses and, for something a little extra, dust over some cocoa powder or lightly place chocolate covered coffee beans on top of the velvety foam. This cocktail comes with a disclaimer: we can’t promise that it comes with a guarantee of a new squeeze! The great news is that this one is decadent and delicious, but also reasonably low in alcohol so you can avoid a sore head or an early night. It’s also frozen, so it’s refreshing! Pour all the ingredients into a blender and blitz until smooth. Next, pour into glasses and get creative with the garnishes; white chocolate shavings, strawberry sherbert, fresh strawberries etc. If the mixture is too thick for your liking, add some milk before pouring and blend for longer. If you don’t have a sweet tooth, the Brogue is a great option. It’s also pretty romantic with masculine flavours of Scotch whiskey and the femininity of floral lavender. It can be a bit fiddly to prepare but it’s worth it. It was created by Leo Robitschek, a New York mixologist of great renown. If you enjoy a Rusty Nail, you’ll love this! Once the syrup is prepared (and we appreciate this can take some time! ), the rest of the cocktail is a doddle. Pour all the ingredients into a cocktail shaker and shake well for a full minute. Strain into cocktail glasses and add a cube or two of ice. To really enhance the botanical flavour of this drink, sprinkle over the fresh lavender. Alright, party animals, this one is for you! From Dusk ’til Dawn is a layered shooter with bite; more tart than sweet. Layered cocktails are a real taste experience and look fantastic. It’s a great cocktail to prepare at parties, but works really well in a more intimate setting! To prepare this cocktail, the ingredients need to be added in this order: kirsch, Cointreau and then cream. Layering can be tricky but it’s worth perfecting the process to impress your sweetheart. For guidance, check out this article on achieving the perfect pour. No matter what you get up to this Valentine’s Day, make sure you’ve got a delicious drink in hand to celebrate a treasured union, commiserate lost loves or toast to independence! Happy Valentine’s Day!